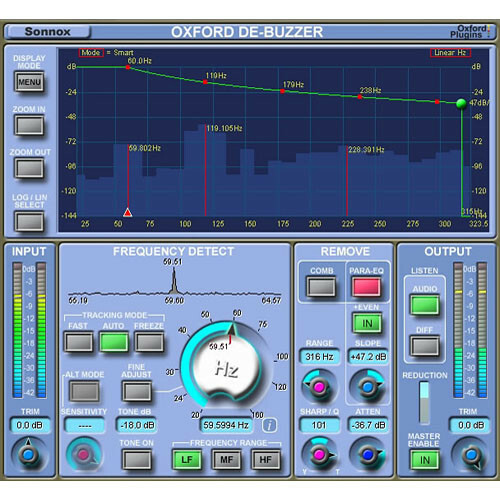 The plug-in features several ways of helping isolate the fundamental frequency. First is the Peak Profile that shows the strength of a given nominal frequency in the input signal. Second is the large FFT display which accentuates any frequency components that are consistently present, making them stand out in the plot. It will automatically mark the three highest peaks found, and the nominal frequency can then be set by clicking one of the peaks on the graph. The third method uses a tone generator in the same way that one can tune a guitar. As the generated tone moves closer to the fundamental, the beat frequency between the tone and the fundamental will become slower and slower. Noise removal is accomplished using a comb filter. The comb filter has multiple tight notches that eliminate the fundamental frequency and associated harmonics.